Disclaimer: This a sponsored post for SheSpeaks/Procter & Gamble. Warm weather will be here before you know it. Instead of covering up every inch of our bodies, we will be putting away those heavy clothes and hunting for summer clothes again. Since we’ll be showing more skin with our sun dresses, shorts and halters, we need really smooth legs and underarms. When I received the invitation to participate in this She Speaks project, I thought reviewing the Gillette Venus Swirl Razor and Olay Swirl Shave Gel couldn’t have been timed better. 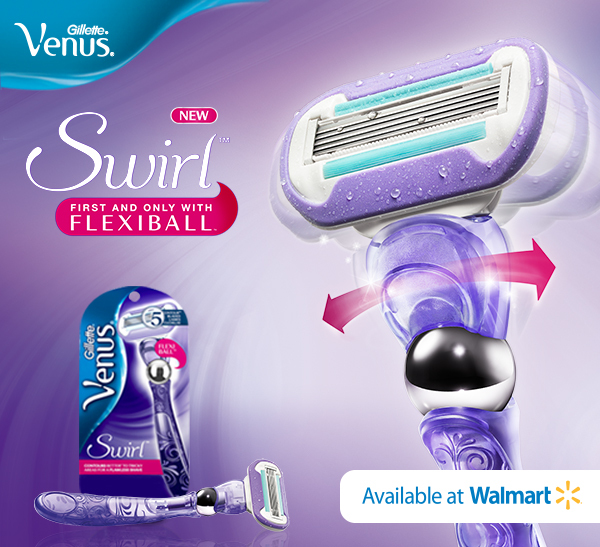 What is so special about the Gillette Venus Swirl Razor is its revolutionary FlexiBall design, which has the ability to move in multiple directions and yet hug the body as it travels for the closest shave ever with its five blades. A built-in MoistureGlide serum automatically gets activated when water touches it for added gentleness as that razor glides and maneuvers over that curvy, complicated terrain of a woman’s body without knicking. The Gillette Venus Olay Violet Swirl Shave Gel made it that much easier to shave. My legs felt so silky smooth when I finished like I just applied lotion. Whether it was just due to the razor or using that wonderfully scented shave gel together, I loved how it protected the skin from those irritating knicks while making that shaved area so touchable. I don’t know about you, but this Gillette Venus Swirl Razor and Olay Violet Swirl Shave Gel are my new best friends for not only warm weather–but all year round for beautiful, silky legs that my guy can’t get his hands off of. Ladies, take my advice, you need to try both of these products because you’ll love the difference they make in your appearance with those tempting, smooth legs. To learn more, visit venusswirl.com. You can also connect with Gillette Venus on Facebook or on Twitter @GilletteVenus. Thanks to She Speaks and Gillette Venus, one lucky Nuts 4 Stuff reader in the United States wins a $20 Walmart Gift Card so that they can purchase their own Gillette Venus Swirl Razor and Olay Violet Swirl Shave Gel! Eligibility: Open to USA addresses. No PO Boxes. The winner will need to respond to my email with name and shipping address within 48-hours or another winner will be picked. How to Enter: Please use the Rafflecopter widget if it works. You can also enter by clicking this link or try to enter using another browser. You can return daily and log in again with your email to tweet or to vote daily for Nuts 4 Stuff on Picket Fence Blogs. 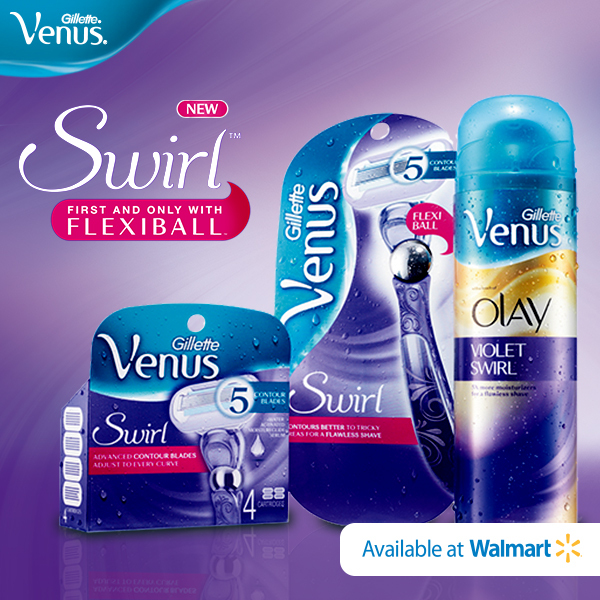 I learned about the flexiball in the New Venus Swirl! I always have trouble getting nicked and cut while shaving. The Venus Swirl looks like it wouldn't do this. Thanks! I learned that the Swirl Flexiball swirls to individually adjust to every curve. I learned that they now have a new razor with a "flexiball"! The flexaball sounds interesting. It provides a smooth and better shave! I learned that "Gillette Venus Swirl razors swivel to follow all your curves for the smoothest shave possible." I'd like to try this razor and shave gel because they're made by Gillette. 5 Contour™ blades individually adjust to every curve. I would like to try this because I like Gillette produvts. I learned they have 5 contour blades with 6x more flexibility. I'd like to try this razor because I think it will do an overall better job shaving. Mine doesn't do a close shave anymore. I learned that the advanced blades have a MicorFine comb to guide hair to the blades to capture virtually every hair. I would like to try this razor to get smooth legs for the coming summer weather. I learned this shaver has a swirl flexiball. I learned that Gillette's blades give you the closest shave because they have a MicroFine comb, which guides hair to the blades to capture virtually every hair. I learned that this razor is 6x more flexible than Venus Original. I would love to try this razor because I am always cutting myself with my current razor. I would love to try these new, innovative products as they seem like they would provide the closest and most gentle shave. I learned that the Gillette Venus Swirl razor has 5 contour blades to adjust to the curves of your skin. I learned that the Flexiball allows for greater motion and flexibility to hit all the contours of your skin. I like the 5 Contours blade. its swirl flexibal with 5 blades..good enough for me baby! I learned 5 Contour™ blades individually adjust to every curve. I love how it has so many blades to catch all the hair and also the flexibility of the razor!! I learned about the rotating ball. I learned that the 5 Contour blades individually adjust to every curve. I learned that the razor has 5 contour blades as opposed to 3 blades on the Venus Original. I learned that the new razor is 6 times more flexible than the old one, wow! I'd love to try this razor and shaving cream because I always have a tough time with shaving my legs. I usually end up with nicks and cuts. Usually with a good quality razor and shaving cream, those problems can be reduced. Well, I found that these are 6x more flexible than Venus Original blades. I learned about the Swirl Flexiball, sounds like if would be a more comfortable shave. I'd like this because summer is coming fast, and a good quality shave is a must! I learned that it is the only razor with a flexiball, allowing the razor to move with you. I would like to try this razor and shave gel because I want smooth nice legs before spring/summer season. I didn't know that they were partnering with Olay for shaving cream. I would love to try this because of the flexiball and the fact that i would only have to shave one time each on my legs. I learned that each blaze curves to the individuals shape. Thanks for the chance! I learned that the blades curve to one's individual shape. I like how it has the flexiball.